I haven’t yet undergone the baptism-by-fire of dealing with a trollish one-star review (although I’ve been assured this is an eventual certainty), but I have received four excellent reviews so far, two four-stars and two five. I was pretty much dancing on air over these, so I thought I’d share them. If you’re into twisted fairy tales, contemporary fantasy, and mythology, this short-story collection is for you. If not, you’ll probably still enjoy it. The author’s writing is addictive. It flows like an undercurrent and pulls you along until you’re sucked into the story with no chance of escape. 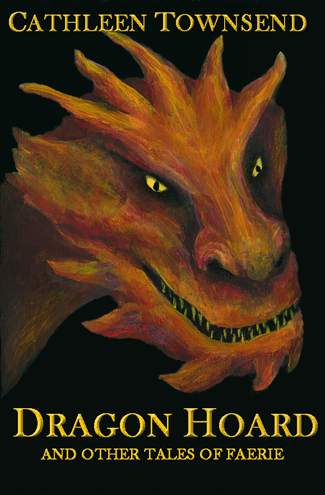 “Dragon Hoard,” the cover story, features a financially-savvy dragon and is a refreshingly-funny take on the well-trod path of dragon lore. “Troll” deals with the existential crisis of, well, a troll. And “Teenage Driver” had me glad I passed my driver’s test quite some time ago. If you’re familiar with fairy tales and mythology, this collection is brimming with Easter eggs. If you’re not, you might find one or two of the story-endings rather elusive. And the stories are so immersive, that the somewhat abrupt ending of a couple of the tales left me feeling dismayed. I wanted more, and these particular stories felt unresolved and more like the beginnings of novels than complete short stories. Hence I subtracted one star from my review. If I had to pick a favourite, it would be “Gargoyle,” which showcases the author’s expert handling of mythic fiction. This touching tale follows the life of a girl through to adulthood, and all the small tragedies that accompany modern life, from the point-of-view of a church gargoyle. The final story, “Fair Exchange,” is a longer piece–a twisted fairy tale that had me rooting for Lottie, the heroine, and wanting to put her father through a meat grinder. Being a fairy-tale ignoramus, it took me almost to the end to realize which tale it was based on. I much prefer the author’s ending to the original. The author includes a bonus prologue and chapter to a novel, Bellerophon. I’m not much into mythology, and I tend to snooze during fight scenes, but the author really shines in both these areas. I would have read on eagerly, had there been more. Alas, I will have to wait for the novel’s release. I received a free ARC of this collection. I give it 3.5 out of 5 stars, bumped up to 4 because I enjoyed it. Dragon Hoard consists almost purely of modern fairy tales, with brief forays into Greek mythology and what might be considered ‘typical’ fantasy. It’s an odd and pleasant thing to find, someone who’s writing fairy tales in the current age of grimdark. Don’t get me wrong, some of my favorite stories are grimdark, but I’ve also read a fair bit of Lord Dunsany, who some might call a grandfather of fantasy lost in Tolkien’s shadow. Dunsany’s work was steeped in fairy tales, in weird magic that was both captivating in charm and somewhat unsettling in mystery. I think the trend has gotten away from that sort of story, with all the epic fantasy and magic bound in rules, and it’s nice to see Townsend return to it. Dragon Hoard is straightforward, easy to read. It is fairy tales of old, stripped of archaic language and dropped into modern settings, with tropes twisted in amusing ways fit for the 21st century. The stories mostly take place among the familiar. A church. A city park. A hotel. The emphasis comes down hard on the ‘charming’ aspect of fairy tales, which is not a detriment but simply a preference some readers may or may not share. There is little of the strange or ‘other’ portrayed in older fairy tales, although I would say Townsend retained all their whimsy. My rating is based on the fact that despite my overall enjoyment, a couple of the stories felt truncated. It seemed like there should be more of a conclusion in some cases, although I will leave them unnamed because stories are such subjective experiences. This was my only basis for reduction of stars; the writing is sleek and never rises up to get in the way of the reading. I read this as a free ARC from the author. Highly recommended – the collection has a great mix of whimsical and more serious stories, with some nice takes on modern-day situations and updates on more traditional legends. I could quite easily have read the book in a single sitting, but ended up dipping in and out over a few days – a story here, a story there – which was equally satisfying. I don’t read a great deal of short fiction, so it’s difficult to draw comparisons with other authors here, but having read this collection I’d definitely pick up more. All in all, a good precursor for the author’s forthcoming novel. A brief and undeniably charming collection of shorts, Townsend channels the best of Matheson and Bradbury, with more than a little Gaiman and Pratchett thrown in to boot. Particular favorites include the titular ‘Dragon Hoard’, ‘Babayaga.com’, and the unexpectedly lovely and emotional ‘Gargoyle’. You can find out more at https://cathleentownsend.com/my-books/dragon-hoard-and-other-tales-of-faerie/. Wow, you’ve gotten some great reviews!! (I don’t mind saying that these really make me want to read it!!!) Do you have it out in paperback?